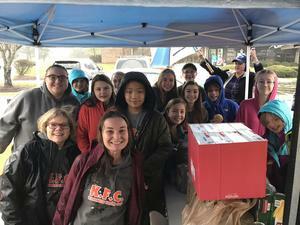 KFC (Kindness From Coy) held a food drive all week to support the district’s Stuff the Bus. Today, in the cold rain and 40 degree temperature, some of the club members volunteered to present the food to Feed the Creek. We filled about half the bus!! These kids are amazing and exemplify what it means to show kindness to all!!! !